We woke to another perfect day, looking back now I see that a 10 day road trip with virtually no rain was indeed a blessing. Even though we traveled in the desert southwest spring rains can still occur. We did get a minor touch of rain on the evening of our last night in Colorado. As we left the Grand Canyon we had just a touch of clouds. 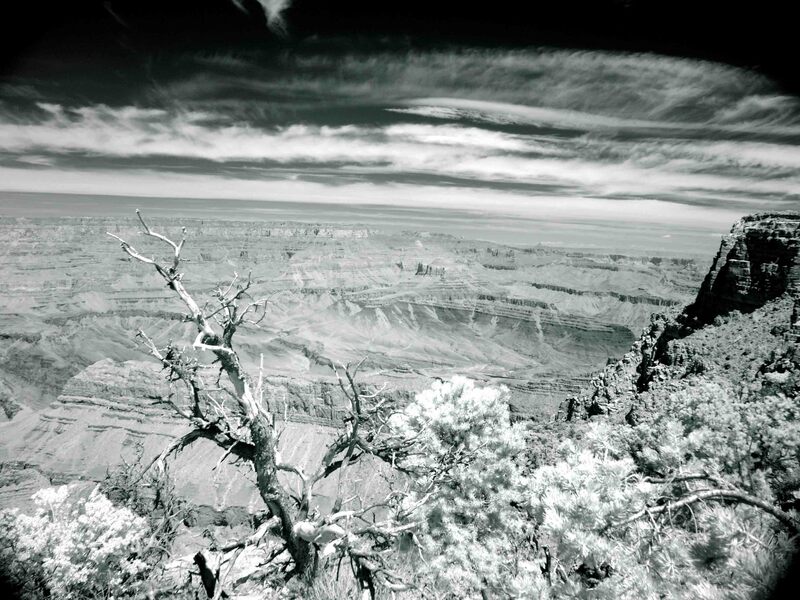 Which is something we were hoping for, at least I was, having some clouds does add to more dramatic Infrared shots. Today was the first day I dragged out the Sony for some IR shots. We started the day with a little hike along the rim trail near the visitor center, it is cool that dogs can join their humans on these trails. 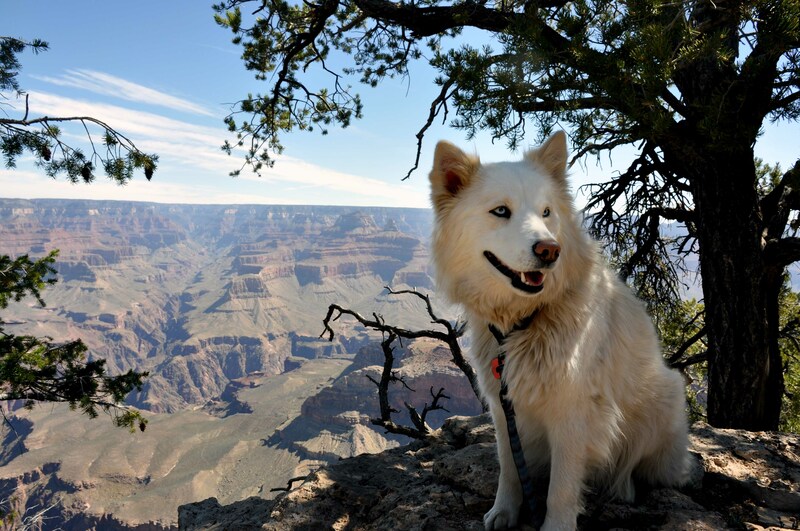 The norm in nearly all National Parks is that no dogs are allowed on any trails. We got a few pics of the dogs, so they can show their friends how nice their humans were to take them on such a cool trip. Tori had commented how the background almost looked fake…as if we were doing a photo shoot in some type of studio with the pull down backgrounds. Eventually we made our way back toward Desert View and out the way we came in. Tori got some cool dolly pics with the canyon in the back ground to show off to her doll friends. We made our way up through Page, and Lake Powell and picked up some more supplies, before heading into Utah. We broke up the drive a little by grabbing a couple of Caches outside of Page. We were 2 for 4, I could have spent some more time looking but I was dressed in jeans and Tori was waiting in the car with the desert heat starting to rise. The drive into Zion was new undiscovered country for both of us. We entered Zion from the east entrance and got to see the canyon after driving trough the Carmel Tunnel…hands down the coolest tunnel I have driven trough in some time. At 1.1 miles it was the longest car tunnel in the US when it opened in 1930. My first impressions of Zion were that it was a cross between Yosemite and Moab! Very unique and from now on…its pure Zion. We made our way to Watchman campground and our three nights worth of reservations. The loop we camped in was a tent only loop, and no generators were allowed, one bonus we were looking forward to. 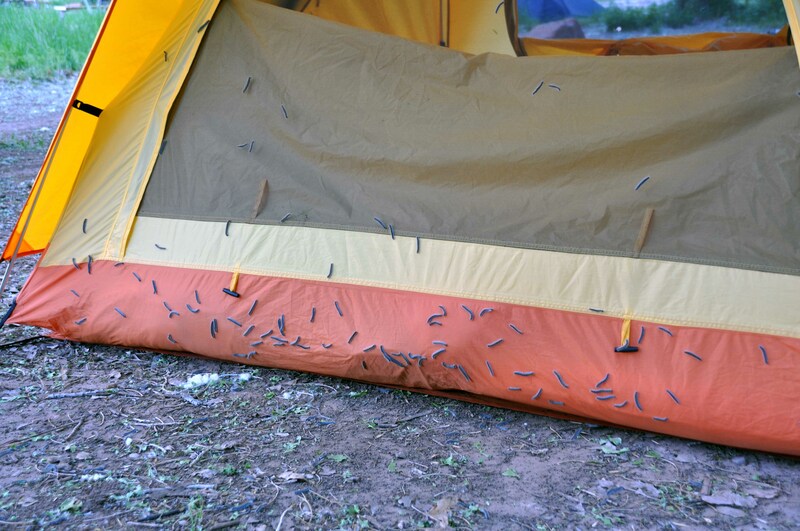 However, we had an unfortunate swarm of caterpillars in our camp…it was so bad we ended up moving to the other campground, which turned out to be better for its awesome stars and canyon views. Our first camp was reserved sight unseen online, South Campground, the other main campground in this part of the park, is first come first served. With the help of one of the excellent park rangers (Juli Neff ) we were taken care of and our former site was quarantined due to the ‘pillar infestation. Thanks Juli…you Rock! We had dropped the pups off at the doggie dude ranch first thing in the morning so the move to the other site was pretty quick. We had a shortened hiking day because of the move, but made up for it by staying an extra day. One of the joys of first come first serve is nobody has dibs on your spot until you leave…so grabbing an extra day is a piece of cake. That Grand Canyon picture is really excellent. Beautiful!